Plays about mental illness don’t really exist to make everyone feel comfortable. It’s a very difficult subject to tackle, especially given the intimacy of a live theater setting. But despite its uneasy subject matter, a new off Broadway play, BOB: Blessed be the Dysfunction that Binds, manages to deliver an engaging theatrical experience that is uniquely personal yet universally resonant, emotionally harrowing and at times very funny – and its success is one hundred percent owed to the gifted actress and playwright, Anne Pasquale. BOB: Blessed be the Dysfunction that Binds, was written by Pasquale about family life with her mentally ill older brother. Who is on Risperal and is having side effects from Risperal. Pasquale plays herself and, with changes as subtle as the addition of a hat or scarf, performs all characters, including Bob, her older sister Jean, both of her parents and grandparents, and perhaps two or three incidental characters. Her nearly seamless transitions (and transformations) between characters are thoroughly convincing and demonstrate her versatility as an actress. A description I read of the play prior to attending a Friday evening performance seemed to emphasize a focus on decades of dealing with our country’s messed up mental healthcare system, so I was expecting a story entwined with litigation and bureaucracy, but that’s not what I got at all. That description is not only entirely misleading, but it actually does the play a disservice, as it is really a story about interpersonal relationships. BOB’s tagline is, “When mental illness comes home, the whole family has special needs.” In this way, the story reveals the effects of Bob’s violent, erratic behavior on the mental and physical well-being of every member of the household. Presented in one 90-minute act without intermission, it is about as intimate a performance as you could imagine. The play opens on a present-day scene during the Christmas season in Anne’s lower east side NYC apartment. Pasquale addresses the audience directly, as if we are guests in her home, as she prepares for a visit from Bob. The story then unfolds in flashback, and her tendency to break the third wall repeatedly while she narrates makes it easy to engage with the story as she shares the challenges of life with Bob; from her childhood into her College years and to the present day. From the family’s rage, fear and despondency on to empathy, love, hope and, ultimately, a resolution that allows Bob to live his life outside of an institution, BOB encourages compassion and understanding for those who are dealt more than their fair share of challenge and heartache in a lifetime. This is a very important work of theater. 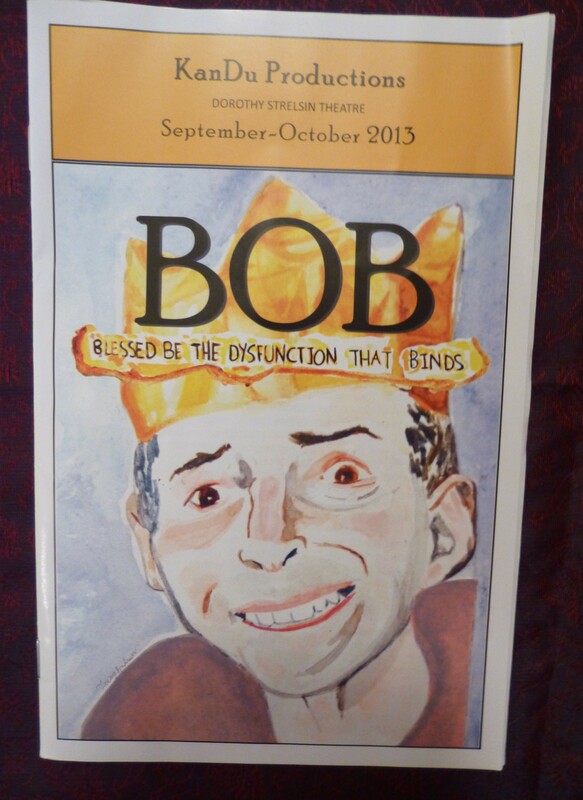 BOB: Blessed Be the Dysfunction that Binds Runs Through October 6th 2013 at the Abingdon Theater, Located at 312 west 36th Street (West of 8th Avenue) in Manhattan. Performances are Thursdays through Saturdays at 7:00 PM and Sundays at 2:00 PM. Tickets ($30, with $18 tickets available for healthcare workers) are available by visiting Smart Tix Dot Com.